When you work with the skin, you quickly learn that most of what shows up is a response to internal or external factors. The skin’s main function is to be a living, breathing barrier between our internal and external environments. It's the last organ to receive nutrients from the bloodstream and our first line of defense for external pathogens — this means it’s really important to nourish ourselves effectively to make sure that our nutrients reach all the way out to our skin. At Annmarie Skin Care, we do make skin care that supports your skin's natural defenses, but that leaves the other half of the equation up to internal maintenance. I’m constantly recommending that my clients, friends, and family drink herbal teas because it is the best and safest medicine for maintaining health over time. Consistent tea drinking gives your body what it needs in doses that it can handle. 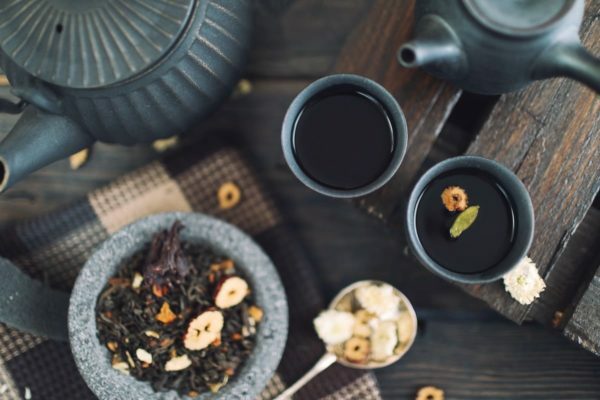 Teas are a really wonderful way to boost your body’s hydration, and because we’re made of 65-80 percent water, the constituents that hot (and cold) water pulls out of the herbs are really absorbable for us. The loveliest thing about herbs is how versatile they are. Most herbs have a myriad of actions associated with them, so it isn’t hard to come up with a tasty blend that does a lot of good in your body. We’re always looking for ways to keep our skin glowing and youthful and a good tea blend can offer us some really beautiful results! 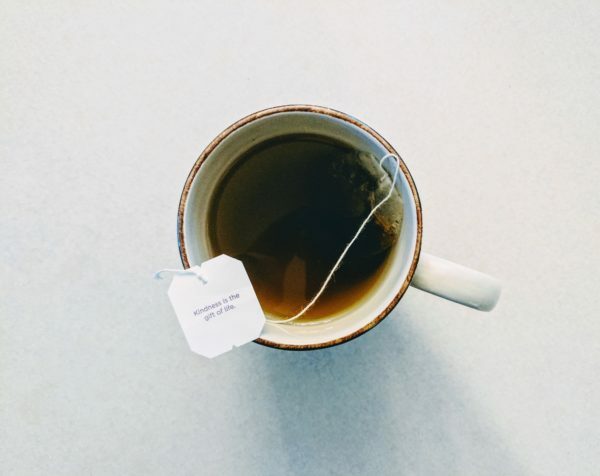 When you’re creating an herbal tea blend (or any kind of herbal formula) you always want to look at what your goal is and what issues might be standing in the way of that goal. It might be obvious, but when the goal is ‘youthful skin’ you want to work to counter the causes of aging. There’s no way to slow down time, so let’s think about aging in a different way. As we age our DNA is changed and damaged by natural wear and tear. We breathe oxygen to live, so we are literally oxidizing our bodies every time we take a breath. Our cells are fed by glucose, so our body breaks down our nutrients into sugars. Though many of us consume too much sugar — and that's something we can work on — glycation is a natural part of the living process. Stress is also a natural part of our lives — without a bit of stress we would have a hard time accomplishing our goals. Over time, stress hormones and especially excess stress are considered to have a negative effect on us — yet again, it’s another part of aging. The idea behind a youthful skin tea blend is to equip your body with tools to nourish the skin even though these processes are going on. Since we know the actions of herbs through knowledge that has been passed down through the ages and (very recently) through scientifically breaking down plants into their constituents, we’re able to directly reduce the look of aging on the skin. But let’s go a little bit deeper and create some tasty, youthful skin teas based on skin type. When you’re making a tea for daily use, you want to work with gentle tonic herbs that will help bring your skin into balance rather than a tea blend that will push your skin in the opposite direction. Additionally, I ascribe to the traditional way to drink tea — I suggest steeping tea 2-3 times before throwing out your herbs. This will make sure that you’re getting all of the nutrients out of your herbs (some take longer to be released), you’ll have more water in your body, and your blend will last much longer. I suggest supporting your local herb store for your tea blend, but if there isn’t one close to you, Mountain Rose Herbs or Pacific Botanicals are great online retail stores for your herbs. If you’re experiencing oily skin, you want to add herbs that will help balance out your skin. Cleansing and cooling herbs are helpful and great creating balance in the whole system. Equal parts: Steep 2-3 times. What you’re experiencing on the outside of the body is really indicative to what’s happening internally. If you have dry skin externally, I always add juicy herbs to help support to the skin. Combination skin is the most difficult to work with externally, but internal skin work is all about balance! We want to focus on nutrients and minerals to help feed the skin so that it can balance itself. beauty blend…for all skin types! We love tea so much at Annmarie Skin Care that we decided to make a blend ourselves. Our Beauty Blend is a heart hugging organic potion stocked with antioxidants, phytonutrients, bioflavonoids, and age-defying fruits. We hijacked some of our favorite herbs from our skin care creations for this tea. Sea Buckthorn Berries, Horsetail, and Gogi Berries are just a few members of the dream team here, feeding your glow from the inside out! But dont take our word for it—pick up a canister for yourself! Shop here. Do you have a favorite herbal blend for your skin? Let us know below! Having a youthful skin can be achieved not just by buying beauty products to apply in your skin but also with the kind of food you eat or drink. Yes, an herbal tea would be a great help because it’s made naturally and the ingredients used in it are all good and can benefit the skin. Thanks for sharing this tea recipe. Thank you for these great recipes. What do you mean when you say steep 2-3 “times”? Wow. Thank you for such an informative article. Although it’s probably safe to assume, I just wanted to double-check that the ingredients for the three different tea blends are in fact all vegan? Thanks so much in advance. All of these ingredients are plants! Debra I hope you feel better. If you truly are feeling suicidal please talk to someone 800-273-8255 is suicide hotline or a friend or an M.D. I think seeing an M.D. who can evaluate your mood and hormones would be a good idea. Best wishes. I recently made a tea from fresh ginger, then whisked in some matcha and squeezed in fresh lime. I know matcha and ginger both support skin health, and the vitamin c from the line supports our collagen production. It tasted great too! I featured it on my blog where I also review many of your products.